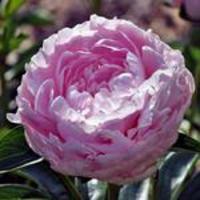 Full double, variable Semi-double on younger plants or smaller stems, large, light pink petals with excellent substance throughout, broad guard petals surround the narrower inner petals. Usually one flower per stem. Stamens sparse, a thin ring is found between the two levels of the flower and another surrounding the carpels at center, forming a full flower type that until the recent decade or so was limited almost entirely to cultivars of later opening cultivars of the Lactiflora Group. Carpels are softly hairy, usually abortive, only sometimes entire and capable of bringing seeds to maturity. The plant is vigorous in growth, and gives a good rate of increase. Strong stems of medium to tall height are clothed in luxuriant bluish green leaflets. The stems stand well against wind and weather, even in the open field. Promises good cut flower qualities. Seedling 3039. Parentage: 'Salmon Dream' x 'Pink Vanguard'. First flowered 2001 or before, first propagated 2001. 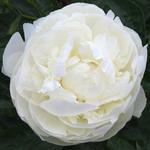 Usually one FULL DOUBLE flower per stem, but sometimes SEMI-DOUBLE on younger plants or smaller stems. 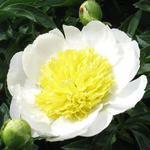 Flowers are 5-6 inches in size (12-15 cm), and open Early Midseason (3rd week). 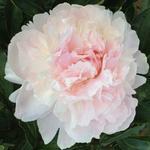 Light pink petals throughout (RHS: 62A / 68B) fading to silvery at the tips when matured outdoors in the sun. Broad guard petals surround the narrower inner petals. Stamens sparse, a thin ring is found between the two levels of the flower and another surrounding the carpels at center, forming a full flower type that until the recent decade or so was limited almost entirely to members of the later opening cultivars of the Lactiflora Group. Carpels are softly hairy, usually abortive, only sometimes entire and capable of bringing seeds to maturity. The plant is vigorous in growth, and gives a good rate of increase. Strong stems of medium height are clothed in luxuriant bluish green leaflets. The 32-34 inch (81-86 cm) stems stand well against wind and weather, even in the open field. Pollen fertile; seeds produced when normal carpels are pollinated.